Karma turned 4 months on Nov 11th. She loves going to preschool and training. Her favorite toys are her collections of balls. She loves all shapes and sizes. This past Election Day she happily walked us over to the election booth. 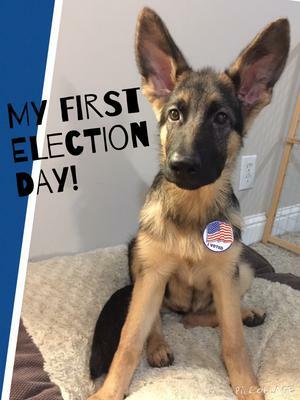 Here is a picture of her on her first Election Day ever.